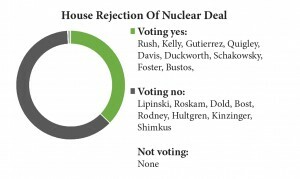 Dispute Over Side Deals: In a party-line vote of 245 for and 186 against, the House on Sept. 10 passed a non-binding GOP measure (H Res 411) asserting that President Obama failed to provide Congress with all relevant documents on the Iran nuclear agreement, as required by the Iran Nuclear Review Act. Republicans cited missing information on two side deals between the International Atomic Energy Agency (IAEA) and Iran. Due to the omission, they said, the 60-day period for congressional review of the agreement was never triggered, setting the stage for a likely court challenge. By contrast, Senate GOP leaders did not raise the side deals as a major issue. Democrats said the two inspection arrangements, which concern Iran’s historical pursuit of nuclear weapons, exist outside of the six-country nuclear accord and are not essential to its enforcement. A yes vote was to accuse the president of withholding certain information on the Iran nuclear deal. 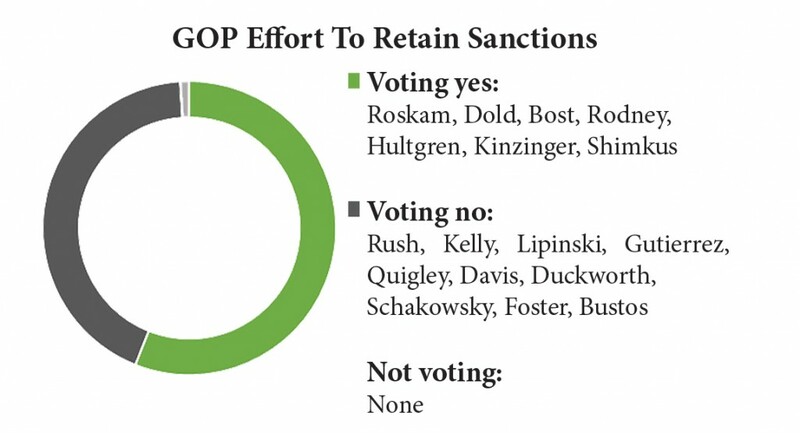 GOP Effort To Retain Sanctions: Voting 247 for and 186 against, the House on Sept. 11 passed a measure (HR 3460) to prohibit President Obama from revoking U.S. economic sanctions as part of the Iran nuclear deal (above). The prohibition, which would kill the deal, applies to an array of sanctions the executive branch and Congress have imposed in recent years on Iran’s energy and financial sectors and other parts of its economy. A yes vote was to kill the deal by keeping sanctions in place. House Rejection Of Nuclear Deal: In a largely symbolic party-line vote of 162 for and 269 against, the House on Sept. 11 opposed an agreement signed by Iran, the U.S. and five other nations that would dismantle Iran’s nuclear-weapons program for at least 10-to-15 years while lifting U.S. and international financial and oil sanctions that have damaged the Iranian economy. Because the deal is an executive action not dependent on congressional approval, this GOP bill (HR 3461) lacked force of law to stop or change it. By contrast, Senate GOP leaders used a binding resolution of disapproval (below) as their legislative vehicle for addressing the agreement. 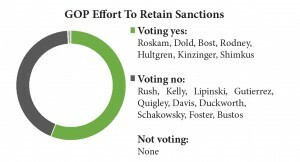 A yes vote was to support the Iran nuclear agreement. 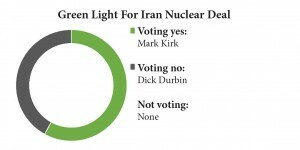 Green Light For Iran Nuclear Deal: Voting 58 for and 42 against, the Senate on Sept. 10 failed to reach 60 votes needed to advance a resolution (HJ Res 61) disapproving of a nuclear deal signed by Iran, the United States, Great Britain, France, China, Russia and Germany. 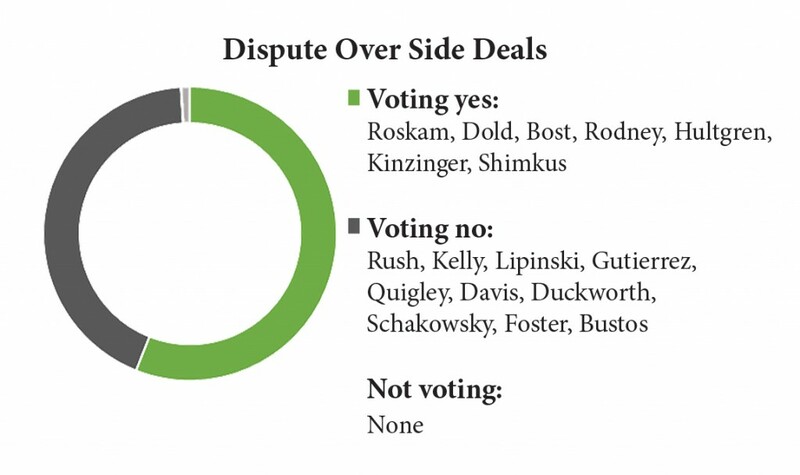 This vote, which sustained a Democratic filibuster against the resolution, effectively removed the last congressional obstacle to the international accord taking effect. The agreement requires Iran to immediately dismantle, and then suppress for at least 10-to-15 years, a nuclear-weapons program thought by experts to be within a year of going operational. In return, Iran would gain access to approximately $100 billion of its assets that have been frozen abroad by U.S. and international economic sanctions. These sanctions, as well as ones on Iran’s energy sector, would be lifted as soon as inspectors certify Iran’s compliance with the dismantling stages of the deal. The agreement allows international sanctions to immediately “snap back” if Iran is found to be cheating on the deal. The agreement would diminish Iran’s nuclear capability to where it would need several months to a year, or longer, to be restored. The U.S. and other countries say this “breakout” period gives them ample time to mount military strikes against any resurgent nuclear-weapons program. Under the deal, international inspectors are guaranteed access to any Iranian facility within 24 or fewer days of their request for entry. Critics say such a delay would enable Iran to cover up its nuclear activity, while defenders say any quantity of radioactive material remains easily detectable after 24 days. A yes vote was backed a resolution to would kill the nuclear deal.